Heaving to is a strategy for riding out a storm. Thrashing to windward while going nowhere can be hard on the boat, gear and crew.The trick is to get the yacht to lay around 45 degrees in to the wind and sea. Be aware however that you will make leeway downwind so you will still need to maintain an active watch. Check sea room – do you have space to drift in view of the forecast? Back the stay sail to windward by trimming the windward sheet. Check the sail for areas that may chafe. 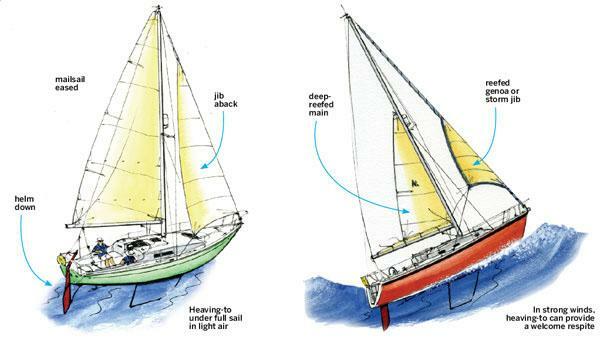 Ease the reduced mainsail until the boat stops all forward motion. Put your rudder hard to windward (i.e, push the tiller to leeward, or lash the wheel to windward. Take care that you don’t go head to wind. Check out these cool videos made my Yachting World featuring Skip Novak sailing around Cape Horn with all sorts of heavy weather techniques. He said he much prefers to Heave to as opposed to streaming warps or a drogue. Video numbers 4 & 8 are the ones relevant to this post. And it’s not just in foul weather that this sailing technique gains its merit. For anyone who considers boat safety important, leaning how to park a sailboat safely on the water so that you can devote time to handling other priorities is a “must learn” skill. Wave heights and patterns differ, wind intensity varies, risks abound. Skippers need to learn how to stop their sailboats just as importantly as they need to learn to steer and move them. Many unfortunate souls go to sea without mastering “heaving to.” They regret their oversight, and then learn how to do it right. And it also comes in handy if you happen to catch a fish along the way! Will give that a go when the water warms up a bit!